But I can always use more of a reality check into what people I don’t know think about politics and the election. I’d love to hear what you think: what are you excited about, confused about, fearful of with a new mayor Rob Ford about to take the helm? Let me share with you some comments I overheard from strangers having conversations about Rob Ford’s policies post-election. First up: Tuesday Oct. 26 the day after the election. It was raining. The streetcar took 15-20 minutes to arrive. It was standing room only with very little room for any more passengers when I overheard a woman ask the streetcar driver about Rob Ford’s policy to get rid of Toronto streetcars. I could not hear well enough or get close enough to hear their 15-minute discussion on the likelihood of streetcars being shelved. But it was interesting to hear her raise this concern about what she heard regarding Rob Ford’s intentions. 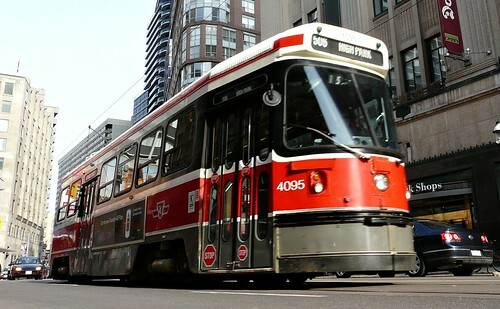 During the mayoral campaign, Rob Ford spoke often about getting rid of some streetcars and replacing them with buses. “It will also improve traffic flow,” Ford’s transit plan states. Was it downtown, suburbs that gave him most support? Rob Ford is mayor-elect in Toronto having gotten 383,501 votes to win. In second place was George Smitherman with 289,832 votes. Ford beat Smitherman with 93,669 more votes. The mayor is elected city-wide, but what areas of T.O were Ford’s biggest supporters from? Curious? I was. Today, the city election office released poll-by-poll results for all mayoral candidates. This let us know which of the 44 wards Rob Ford got his support from and where second-place finisher George Smitherman won his votes. Let’s take a look (and check this out to see where past mayor’s got their support). In Scarborough’s 10 wards Ford overwhelmingly beat Smitherman. In Etobicoke’s 6 wards picked Ford by a huge margin. More voters in York’s 6 wards loved Ford too than Smitherman. North York and Don Valley wards also loved Ford. Parkdale-High Park and the downtown core loved Smitherman. Midtown was split with half of it voting more for Ford and the eastern part voting more for Smitherman. Davenport (west end of downtown) half of it voted Ford and the other half supported Smitherman. Mayor-elect Rob Ford at the Town Crier's editorial board. Town Crier file photo. Here’s a run down of the winners, upsets, and top place results for the Oct. 25 vote. Of the possible 1,546,732 eligible voters, voter turnout was about 52.6 percent, which is up from the 2006 election with 39.3 percent. RESULTS: Toronto here’s your new mayor and 44 councillors. Mayor-elect is Rob Ford with 383,501 votes for 47.11 percent followed by George Smitherman in second with 289,832 for 35.6 percent, according to the city’s website. Of course, 38 other mayoral candidates were on the ballot and results for each can be found here and may vary as the city updates the election results. Here are the councillors-elect for all 44 wards with a list of each winner and closest runner-up. For a full list of all candidates votes in each race, click here. Etobicoke-North Ward 1: Vincent Crisanti won with 40.75% of the vote ousting incumbent councillor Suzan Hall, who got 36.96%. Newly elected Ward 22 councillor Josh Matlow gets a celebratory hug from his mother Elaine Mitchell. Photo by Kris Scheuer/Town Crier. The battle for Ward 22 is over and school board trustee Josh Matlow has come out on top. Matlow won with 11,892 votes while Chris Sellors came second with 8,037 votes. At his victory celebration councillor elect-Matlow, surrounded by supporters including his wife Melissa, father Ted Matlow and his mom Elaine Mitchell, expressed his gratitude to all those who helped him during the campaign. WARD 26 CANDIDATES Salim Nawab Khan, left, Shaukat Malik, Yunus Pandor and John Parker answered questions from a packed house at the Leaside Memorial Gardens. Photo by Kris Scheuer/Town Crier. A Ward 26 all-candidates debate was hot last night and not just because 250 people packed a room inside Leaside Memorial Gardens. There were questions on job creation, heritage, the arts, transit among others, but things got quite heated when resident Lise Lareau asked who distributed anonymous literature denouncing Mohamed Dhanani’s record. The one-pager, accuses Dhanani of inflating his resume, being involved in the billion dollar e-health spending scandal when he worked for former health minister George Smitherman. It also questions what Dhanani has promised in exchange for an endorsement of the Toronto York Labour Council. Lareau asked each candidate to own up or denounce it. “I had nothing to do with it,” joked Dhanani later adding the info was all lies. Joe Pantalone at the YMCA debate as the only candidate who showed up.Photo by Kris Scheuer/Town Crier. Is it still a debate if only one mayoral candidate shows up? The YMCA and Toronto Community Foundation hosted a mayoral debate this morning with George Smitherman, Rob Ford and Joe Pantalone all confirming attendance. But within an hour of the scheduled event, Ford’s campaign pulled out of the debate and then Smitherman followed suit leaving Pantalone as the only one on stage. No incumbent, who will win heated contest? Ward 29 candidate Jane Pitfield. It’s shaping up to be one of the most hotly contested council races in town: Toronto-Danforth’s Ward 29. It’s got everything: no incumbent, a former councillor as candidate and a party-backed star candidate. Case Ootes, who’s held the ward for almost 22 years, is not seeking re-election. Six candidates in total are vying for the job: Jane Pitfield, Jennifer Wood, Mary Fragedakis, John Richardson, Mike Restivo and Chris Caldwell. Pitfield has the advantage in the final stretch of the campaign, said Ryerson political professor Mitch Kosny. Recent comments. What do you have to say?